A three part documentary series on the greatest tennis player of his day. Sweden’s best known personality abroad. The Björn Borg saga has never been told before. Yet it’s a story with all the ingredients needed to entertain, amuse and satisfy. This documentary tells of an extraordinary time during the 70s and 80s. A time when Sweden gained world-wide fame, not only through Björn Borg, but also through ABBA – both products of that era. 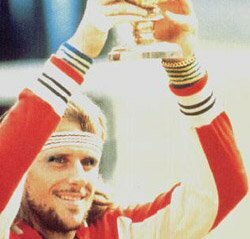 Born in 1956, Björn Borg began playing tennis when he was nine, won his first competition at 11, and his first two Davis Cup matches at 15. By 18 he was the youngest player ever to win The French Open and is the only person to have won five Wimbledon championships in a row. By the age of 26 he had six French Open titles to add to his Wimbledon crowns and had amassed an astounding 763 victories. Björn Borg’s all-consuming development as a world-class sportsman had left him dangerously ill-equipped to venture beyond the tennis court. Borg’s life has never been only tennis. Three fateful women played remarkable roles in his life. And one special incident attracted world-wide attention. The press called it a suicide attempt; Borg says it wasn’t. His financial moves became the talk of Sweden. He built up an international fashion empire and then suddenly closed it down. But although the trademark continues to flourish, Borg claims he is almost broke and denies the trademark is his any longer. This probing documentary strips away the myths that have surrounded Borg for nearly two decades, and shows what made it possible for this young man to evolve into the world’s Number One tennis player; among the first of an emerging group of multi-million dollar global sport stars.